Please accept this letter as my sincere appreciation and reference for the attention given by the various members of your team to completing the roofing needs of our recently purchased home. My first thanks are extended to Ashur Shiba your crew supervisor/estimator and lead on this job. His openness to information, suggestions and overall communications with us throughout this time has been excellent. Although we wish he had better control over the weather he was diligent from start to finish on our project. The crew assigned to our home of Jamie and Rob were very hard working, dedicated and professional. They arrived prepared and worked very well together and attended to the roofing needs as they presented themselves. It was appreciated that they did not simply rush to get this done but maintained a hard working pace through out. Clean up was meticulous and I would recommend this particular crew to any of our neighbours who might need your service. I hope that all three are as appreciated and valued by you as I do especially at their next yearly performance review for re-numeration. 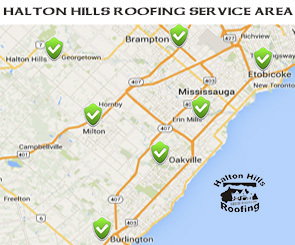 This is the second home that I have had Halton Hills Roofing complete and would not hesitate to recommend your company and its work.